New book, 152 pages. A practical guide to running three-phase equipment on single-phase electricity supplies. Often, model engineers buy industrial workshop equipment, such as lathes, drilling machines and milling machines, which usually require a three-phase electricity supply. Although ready-built phase converters are available, they can often cost as much or even more than the equipment purchased. This book provides an invaluable source of practical guidance on how anyone can find out the type of electrical equipment they have, and how to convert it to run on a single-phase supply. The book provides calculations, step-by-step instructions with photographs and diagrams and covers electricity supplies in the UK, North America, Europe and the rest of the world. Finally, it also advises on which equipment cannot be converted at all. Contents: Terminology; Nomenclature; Basic Alternating Current Concepts; Why Three-Phase? 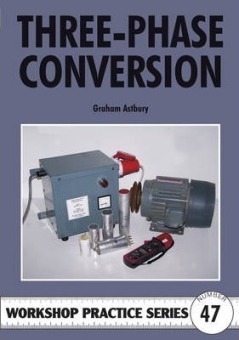 Useful Instruments to Have; Identifying What Equipment You Have; Steinmatz Connection; Phase Converters; Use of a Motor-Generator Supply; Electronic Variable Speed Drives; Wiring Motor Starters and Overloads; Winding Autotransformers; Heaters; The Mathematics of Three-Phase; Notes for Non-European Supplies; Copper Wire Tables; Answers to your Questions.